Magons are a species of enemies in Wario World, first encountered in Greenhorn Forest. They come in small and large variants; the small Magons can be defeated in one punch, while the large Magons are knocked out in a single punch (or three punches starting in Shivering Mountains) and can then be defeated by picking up and throwing them. 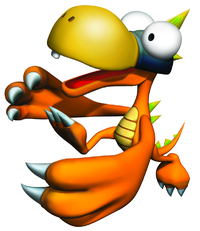 The basic form of a Magon seen in the Excitement Central stages is that of a bipedal yellow (for the small type) or orange (for the large type) lizard with a spike on its head. In later stages, Magons take on differently themed appearances to fit the theme of the level Wario is currently in. All large Magons attack Wario with either a claw swipe or with a sliding attack that does no damage, but can cause Wario to drop any enemy or item that he is carrying. Starting in Wonky Circus, they use an additional tail spin attack, which deals a full heart of damage and stuns Wario momentarily. Small Magons do not attack in Greenhorn Forest, merely approaching Wario in large groups and standing near him, but starting in Greenhorn Ruins they may attack Wario with a fast bite attack. In all stages, small Magons also occasionally run away from Wario in fear, eventually disappearing. If Wario defeats a Magon in this state before it disappears, it drops six large coins instead of just one. Aside from the basic Magons in Excitement Central, Horror Manor uses a skeletal form, Wonky Circus uses a clown form, Shivering Mountains uses a snowman form, Beanstalk Way uses a wolf form, Mirror Mansion uses a puppet form and Pecan Sands uses a mummy form. Each Magon species gradually attacks at a faster rate than the last iteration. According to Wario's description of Magons in the Wario World instruction manual, they do not think about "anything whatsoever". Tamagon portmango of "卵" (tamago) meaning egg and "dragon"
↑ Wario World instruction booklet, page 24 (British English) or page 30 (American English). This page was last edited on April 22, 2019, at 06:49.